Tune into your radio or television or look through the business pages of newspapers and you will be greeted by scary words like the Johannesburg Stock Exchange, investments or stocks and shares. Just what are these things and why do we have to care about them? 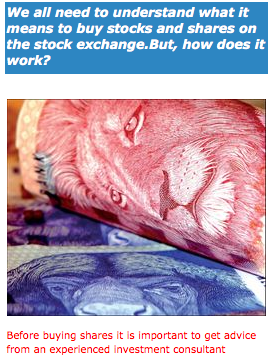 Vuk’uzenzele went to the Johannesburg Stock Exchange, or the JSE as it is commonly known, for some answers. The main buyers of stocks and shares are usually big financial institutions like insurance companies, but private investors may also buy stocks and shares. Stocks and shares, which are also sometimes called equities, are basically the same thing. They represent ownership in part of a company or corporation. This means you buy shares or stocks in a company. By doing this, however big or small, you invest some money in the company and become a part owner of the business, sharing in its success or failure. If you own shares you will receive dividends from the company. Dividends represent part of the company’s profits. A stock exchange is also sometimes called a stock market. It is like an organised marketplace where people trade (buy and sell) the shares of big companies which are on the official list of the stock exchange. The people who work at the stock exchange and who help their clients buy shares are called stock brokers or dealers. They work in line with strict rules and regulations. Many countries have stock exchanges where shares of companies in that country are traded. South Africa’s stock exchange is the JSE in Johannesburg. Buying shares is a way to grow your money. If the company whose shares you bought is successful and grows, your shares will also grow. On the other hand, if the company is unsuccessful, your shares will drop. So before buying shares, it is important to get advice from an experienced investment consultant on which shares to buy. A person who owns shares is called a shareholder. Shareholders have the right to vote on decisions about the company. For more information on the stock exchange, you can ask an investment consultant at your bank to help you, or contact the JSE Education Division: 011 520 7127.